It came to be, in the late nineties and in the decade after the turn of the millennium, that private schools in the Metro Manila and CALABARZON volleyball leagues that De La Salle Lipa participated in loathed the very sight of the elementary and secondary teams in the emerald green and white uniforms. When the school’s four teams – elementary and secondary boys and girls – lined up for the opening ceremonies, this already served a warning to all concerned that they were probably participating to make up the numbers. Indeed, there were those even in the organisational meetings of the school sports directors who already resigned themselves to the inevitable – that it was going to be yet another DLSL season. There were seasons, in fact, when DLSL swept all divisions; and if the school came away with only two of the four titles, it was already seen as something of a disappointment. There was friendly ‘competition’ between the school’s four teams; and the winning culture, in a manner speaking, could even be attributed to the fear of being the team that missed out when everyone else won. All things being equal, perhaps there was not really an awful lot between the DLSL volleyball teams and those of rival schools. It was inside the head that the school’s teams enjoyed a tremendous advantage. The winning tradition was based on the ethics of hard work and love for the game. Every afternoon, during weekends and holidays, the volleyball courts were filled with young boys and girls all trying to hone their skills for the honour and privilege of representing the alma mater. Such was the school’s love for the game of volleyball that an empty court was something of an anomaly. Young boys and girls who donned the green and white knew that they were privileged to become part of a winning tradition; and this instantly gave them the psychological edge over rivals. Opposing players, on the other hand, knew that they were playing against champion teams whose reputation for success was earned through years of consistent successes. Arguably, it was the high school girls’ team of Coach Emily Babasa (formerly Tangcora) which was instrumental in initially establishing this reputation. The DLSL girls won an unprecedented and inspirational four straight national titles in the Palarong Pambansâ in the mid-nineties. This unique achievement immediately established the DLSL girls as the team to beat in any competition. The reputation, however, favourably rubbed onto the school’s other teams. More than this, it was the implicit challenge to the three other teams to live up to the reputation by emulating the successes of the high school girls that ultimately led to the school’s winning tradition in different competitions. Of course, essentially, everything boiled down to the coaches. Of these, Babasa and her counterpart in the high school boys’ team, Rosel Sumcad, had few equals. These two can be credited with the current stature in the national volleyball scene not only of DLSL’s teams but also of the city as well. Indeed, DLSL’s culture of excellence in the sport of volleyball spilled over to rival schools in Lipa City so that ironically, in the present, the school’s sovereignty can no longer be taken for granted as it once was. Babasa was a motivator par excellence. Her man-management skills were extraordinary. She could draw more out of a player than any of her girls even knew they possessed. She was a mother figure but was a strict disciplinarian on the court as well. Her training focused on mental toughness and positive energy. Once in a while, from the football field, I would hear her scream at one of the girls for frowning alone. This was a no-no as far as she was concerned. She wanted nothing but the positive juices flowing. She would later give up her coaching post for health reasons; but after more than a decade out of the game, she recently resumed coaching the high school team. Some things, apparently, are just impossible to get out of one’s system totally; and coaching just happens to be one of those things that run as true as blood inside the veins. In the early eighties, however, the school’s volleyball teams only had moderate successes. In fact, the football team was better known nationally because of its successes in the Coca-Cola Go-for-Goal, which had national newspaper coverage courtesy of the soft drink corporation’s funding. The volleyball teams’ fortunes really took a turn for the better upon the arrival in the summer of 1984 of the Ilonggo Sumcad, a native of Bacolod. He came upon the invitation of Br. Gregory Refuerzo, his former mentor at St. Joseph’s School in Bacolod. The invitation was supposed to be for a summer holiday. He stayed for good after being offered teaching and coaching posts at DLSL by his former mentor. He would subsequently marry the former Juliet Katigbak, a Religion teacher at the same school, and raise a family in Lipa. Sumcad brought with him coaching and training savvy previously earned in the tough sporting scene of West Negros. The immediate beneficiaries of his knowledge and methods were his own players in the high school volleyball team; but the other coaches were learning from him as well – to the greater benefit of the school’s volleyball program. In the nineties, Sumcad formalised his stature as one of the top volleyball coaches in the country by attending a local licensing course sponsored by the FIVB. He emerged from that course as top of his class. This merely formalised what all of DLSL already knew. All success stories in sports are always tinged with a touch of irony; and in Sumcad’s case, despite his numerous inter-scholastic trophies, the national titles that flowed like champagne for the high school girls during the first Babasa-era eluded him in almost three decades of coaching. Fortune, they do say, favours the brave. For his perseverance and dedication in all of three decades, Sumcad finally laid his hands on the holy grail of high school volleyball when his team won the Palarong Pambansâ title in 2013. 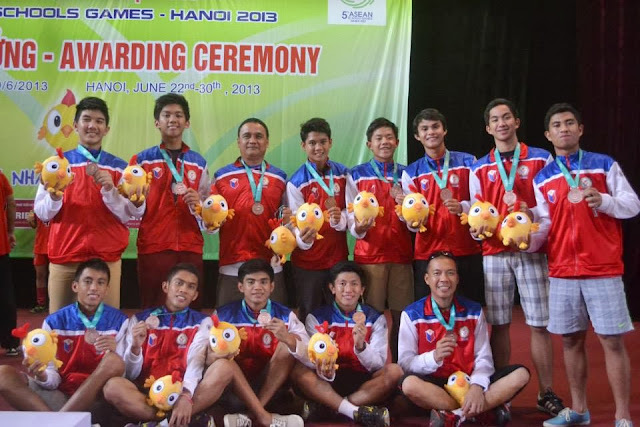 Moreover, for doing so, his team was rewarded with the honour of representing the Philippines in an ASEAN inter-schools volleyball tournament in Vietnam also in the same year. There were those who, curious to learn and perhaps emulate DLSL’s winning culture in the sport of volleyball, would even send scouts to observe the school teams in training. If at all there was a winning formula, it was as open secret for all to see. Boys and girls will continue to go to these courts long after the two coaches are gone. 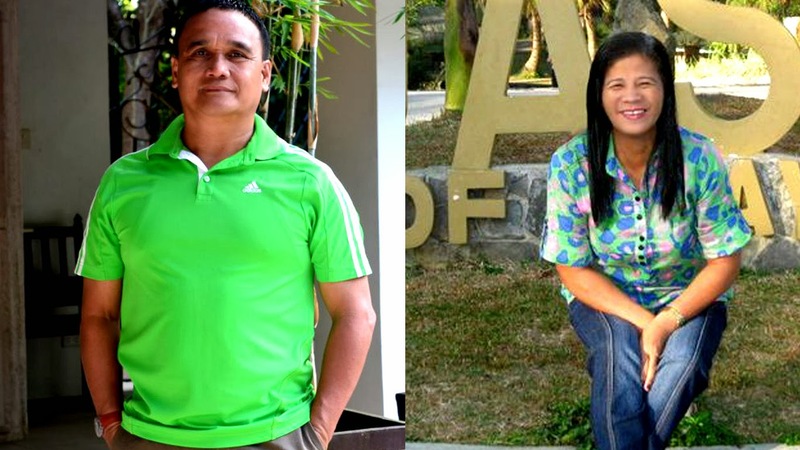 What this article attempts to do is to immortalise for future generations the fact that the tree of success in the sport of volleyball that DLSL continues to enjoy was planted and lovingly nurtured through the years by two coaches: one named Emily Babasa and the other Rosel Sumcad. Acknowledgment: Photos taken from the Facebook accounts of Emily Babasa and Rosel Sumcad as well as the DLSL Archives.